"We have foreign pre-orders," Hilgert said but did not elaborate. "First step is to get the European type of approval because the European approval is accepted in many countries by 80%," he said. "That is the territory where we will definitely be developing. We signed a memorandum (with Tawazun’s Defense, Security and Development Fund - TASS) and we plan to close the deal before the end of the year," he said. 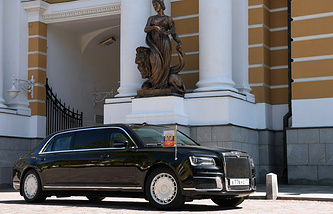 Aurus is a Russian brand of cars for senior officials. The name combines the two words Aurus: "aurum" (a Latin word for "gold") and "Russia."